• Metro Councilman Buddy Amoroso (R-Baton Rouge) will speak on controversies in City-Parish government. • Bob Watts, chairman of the movement to incorporate the City of Watson, will tell why many residents of Watson in Livingston Parish want to have their own city. Business owners, guests, and members of the media are invited to attend the meeting, which will be held at Café Americain, 7021 Jefferson Highway. The reception will begin at 11:30 a.m. and the luncheon at 12 noon. Lunch is $15. There is no charge to the working media. 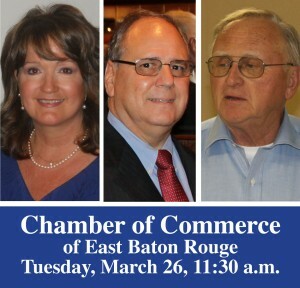 The Chamber EBR holds its monthly membership meeting on the 4th Tuesday of each month. For more information on the Chamber EBR, visit www.ChamberEBR.com or call Bob Breaux at 225-279-6008 or Woody Jenkins at 225-921-1433.